Medellin transformed violence and despair into hope and opportunity, using sustainable transport as one of the key levers to drive change, explained Holger Dalkmann. Photo courtesy of Carlos Felipe Pardo. A version of this post was originally posted on EMBARQ.org on January 24, 2012. WASHINGTON, D.C. (January 24, 2012) – San Francisco, USA, and Medellin, Colombia, were selected as the 8th annual Sustainable Transport Award winners today during the annual meeting of the Transportation Research Board. The slate of nominees included Buenos Aires, Argentina; Cape Town, South Africa; Medellin, Colombia; and San Francisco, USA. The winners were selected based on four characteristics: increasing mobility for residents, reducing greenhouse gas emissions and air pollution from transportation, improving safety, and increasing access for cyclists and pedestrians. Additionally, each city is a leader in using social media and online technologies to reach out to local residents, providing more informative and convenient services. San Francisco, USA, was selected for using parking reform to great effect. The newSFpark variable-rate, demand-response parking management system provides real-time parking availability information online, via text and smartphone apps. The city’s ‘Pavement to Parks’ program reclaims parking spaces for public space and has created 20 new and dynamic parklets with more on the way. The city also started to upgrade and expand its bike network, setting an ambitious target of 20 percent of all trips made by bicycle by 2020. “San Francisco is really a model for how city governments can collaborate with different sectors to create immediate improvements to the environment, economic competiveness and overall well-being of a city,” said Heather Allen from the Transport Research Laboratory. 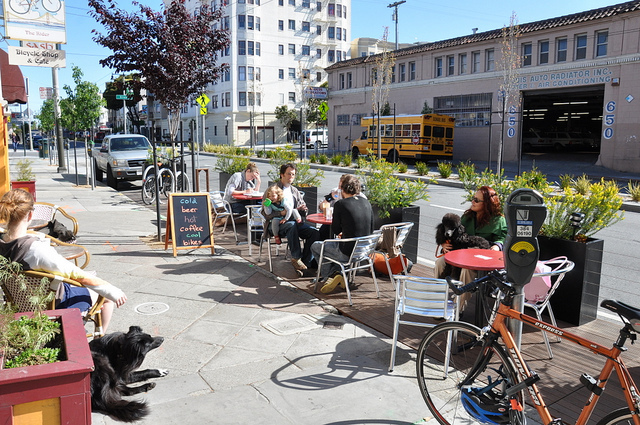 San Francisco's "Pavement to Parks" program transforms parking spots into public spaces. Photo by jeremyashaw. 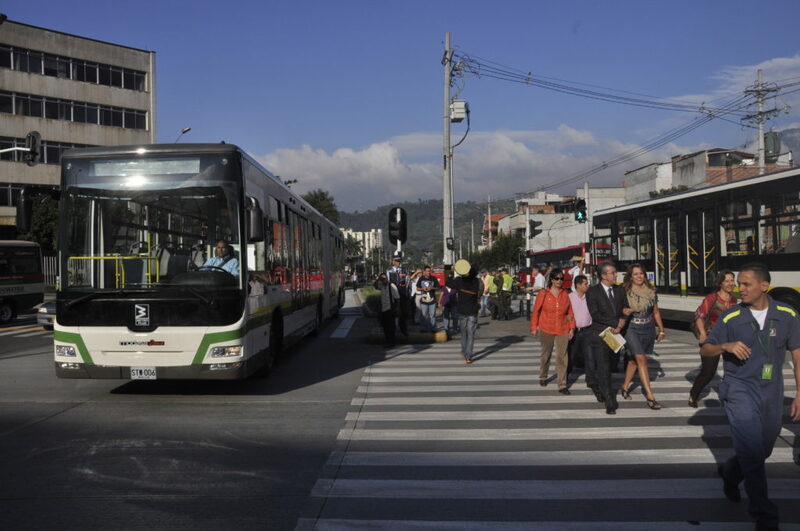 Medellin, Colombia, and its metropolitan area is being recognized for its public space improvements, and providing urban transport options to its citizens, such as its existing cable car and metro systems, and the recently inaugurated BRT project, Metroplús. The city created 1.6 million square meters of new park space through 25 parks and 11 urban promenades. Medellin also made progress with a new public bicycle program, EnCicla, that integrates universities and mass transit with popular city destinations; improved pedestrian crossings; and a ridesharing program, Comparte tu carro; as well as vehicle exhaust emissions controls and sulfur content improvements. Buenos Aires, Argentina, is receiving an honorable mention for opening the country’s first BRT system, Metrobús, and its comprehensive investment in cycling. In addition to opening the first bike share program in Argentina, the city has added more than 70 kilometers of bike lanes. Buenos Aires, recognizing that cycling infrastructure alone is not enough, has pursued a creative campaign around bicycle promotion. Together, this has resulted in a 120 percent increase in cycling in one year. Cape Town, South Africa, recently opened the first BRT system in Africa to integrate cycling. The MyCiTi integrated rapid transit network opened in May 2011 seeking to connect townships, a legacy of apartheid, to the downtown through a high quality service that is a model for its universal access and pedestrian access. The longest continuous bike way in Africa runs parallel to the BRT corridor. The city is expanding its bike lane network, with over 300 million rand (37.7 million USD) worth of projects being built. The Sustainable Transport Award is presented each year in Washington during the annual meeting of the Transportation Research Board, one of six major divisions of the U.S. National Research Council. Past winners of the Sustainable Transport Award include: Guangzhou, China (2011); Ahmedabad, India (2010); New York City, USA (2009); London, UK (2008); Paris, France (2008); Guayaquil, Ecuador (2007); Seoul, South Korea (2006), and Bogotá, Colombia (2005). For more information, photos, and videos about the award and a list of past winners, visitwww.st-award.org. 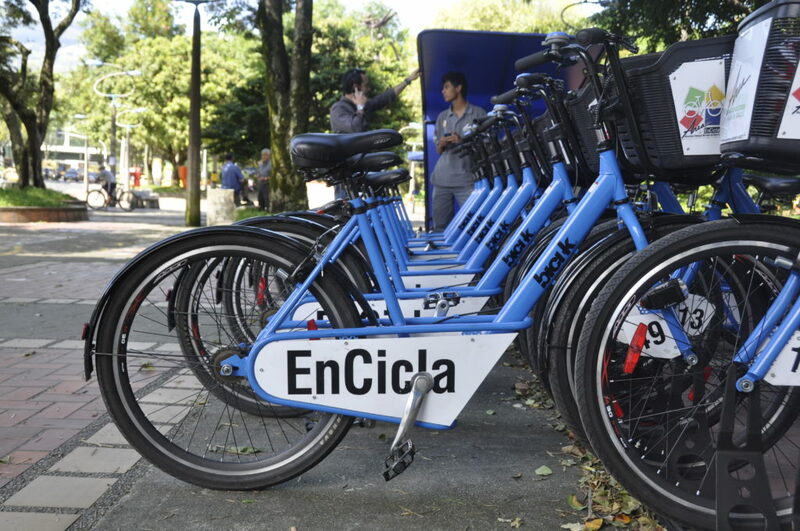 EnCicla, Medellin's public bikes program connects universities to popular destinations through sustainable mass transit. Photo courtesy of Carlos Felipe Pardo. Tags: Argentina, bike-sharing, Buenos Aires, bus rapid transit (BRT), Cape Town, Colombia, ITDP, Medellin, North America, parking, pavement to parks, public space, San Francisco, smart phone applications, South Africa, South America, Sustainable Transport Award, TRB, United States, Washington, D.C.